Can you tell us more about your role, what you do on a daily basis? I’m in charge of managing the online reputation of Ascott’s six properties in Singapore. I look through the feedback we received through post-stay surveys as well as online reviews. And if there are any negative comments, I’ll conduct investigations to get to the root of the matter. If we’re able to address some of our guests’ negative feedback, we can regain their trust. I use this as a way to listen to what our guests have to say so we can serve them better. I also monitor the standards of service at our residences, and I’ll send bi-monthly reports to all the property managers to highlight the areas that need more attention. How long have you been in the industry? I’ve been with Ascott for five and a half years. After 28 years in the airline service industry, I joined Ascott, heading the host team. 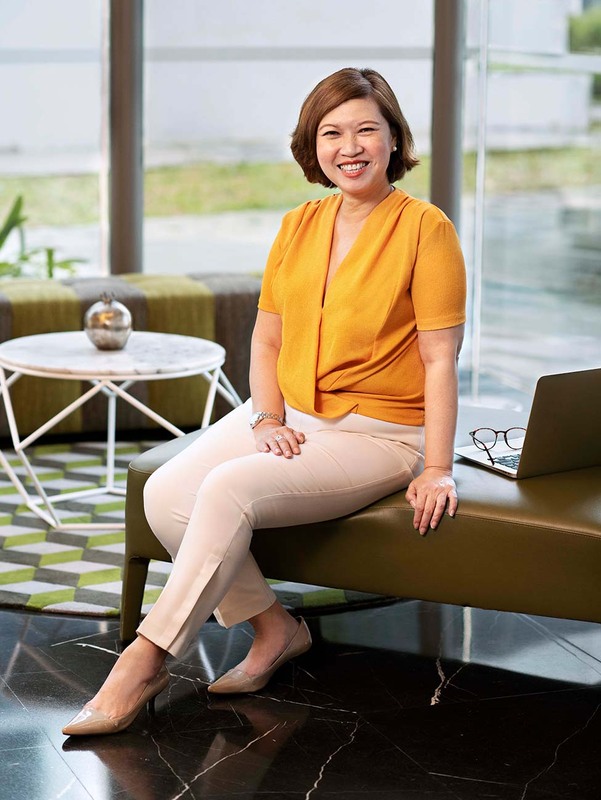 They wanted to enhance the service standards, and have the Ascott hosts play the role of a butler or personal assistant to some of our long-stay guests. When online reputation management became popular, I was encouraged to take up that role because of my past experience in service. What do you enjoy most about what you do? Being able to impress and surprise our guests during their stay. It’s all about recognising their wants and needs, and preparing accordingly. Once, a guest told me that she loved everything about her stay but she didn’t really like a particular type of creamer because it didn’t go well with her tea. We added that information to her profile so the next time she visits us, we can surprise her by preparing her preferred brand of creamer. What has been your most memorable experience in your career in the hotel industry thus far? We once had a guest who has a hyper-active toddler. I understand that it can be tough for moms who are cooped up in their apartment all day, taking care of their children. So I gathered a group of mothers who were also homemakers, and organised tea parties for them and their children. Through this, we ended up creating a community of mothers who can now enjoy each other’s company. Prior to this, you were in the airline service industry. What inspired you to join the hotel industry? I have always liked being in the service line. I enjoy communicating with people. During my time in the airline service industry, I stayed in countless hotel rooms and had experienced varying levels of service. So after retiring from that industry, I wanted to share my knowledge and experience to improve the service standards in the local hotel industry, starting with the Ascott’s service staff. Is there anything that you’ve learned during your time in the airline service industry that you apply to what you do now? Service and observation. I think the most important part of being in the service industry is having good observational skills. A guest may say that everything is okay, but their body language may suggest otherwise. They may be too embarrassed to say what they really think, so we have to pay attention to little details like how the person is sitting or even the way their hands are positioned. I used to tell my colleagues, “You need to be like a shark.” You have to really look around and pick up on these details, in order to know how you can help the guests. For example, I once noticed a lady walking out with her hands holding her stomach. All I did was ask her if she was okay, and I found out that she recently had an operation and she was staying alone. So I gave her my phone number and told her to call me anytime she needed help. It meant a lot to her, and we are now friends. Is ‘profiling’ something that you encourage your team to do? Definitely. We always take note of our guests’ preferences. For example, some may want the air-conditioning to be running constantly, so housekeeping won’t remove the keycards when cleaning up their rooms and some may want a shoe rack by the entrance of the door. It’s the little things that leave the biggest impressions. By tailoring our services, our guests know that whatever they need, they can always count on us to deliver. This can make a significant impact during their stay, and help us stand out from other hotels. Apart from that, what are the most important skills that you teach all the Ascott Hosts? Make an effort to build relationships with the guests. For our long-staying guests, we prepare a special card introducing the Ascott Hosts. We even organise introductory meetings so our hosts can have a proper interaction with the guests. That way, our hosts become more than just a face. And we hope that our guests will then be more comfortable approaching our hosts for assistance. How do you ensure that your team members maintain the highest level of standards? I keep in touch with them regularly through WhatsApp or phone calls. We also role play scenarios to keep us on our toes. What advice would you share with someone who is interested in joining the hotel industry? Enjoy what you do. Whatever you choose to do in this industry, you have to enjoy it. And if you put your heart to it, you probably will succeed. You’ll face different situations every day, and things may move very quickly. But the only way you can continually provide good service to your guests is to have passion for what you do. When you have passion, you’ll be able to impress your guests.